The survey concentrated on the opinions of EU companies on the investment and business environment that South Africa offers to them. The overall aim of the survey was to contribute to improved dialogue and advocacy between the EU business community and South African stakeholders. The overall satisfaction of the overall business environment in South Africa by EU companies were low. 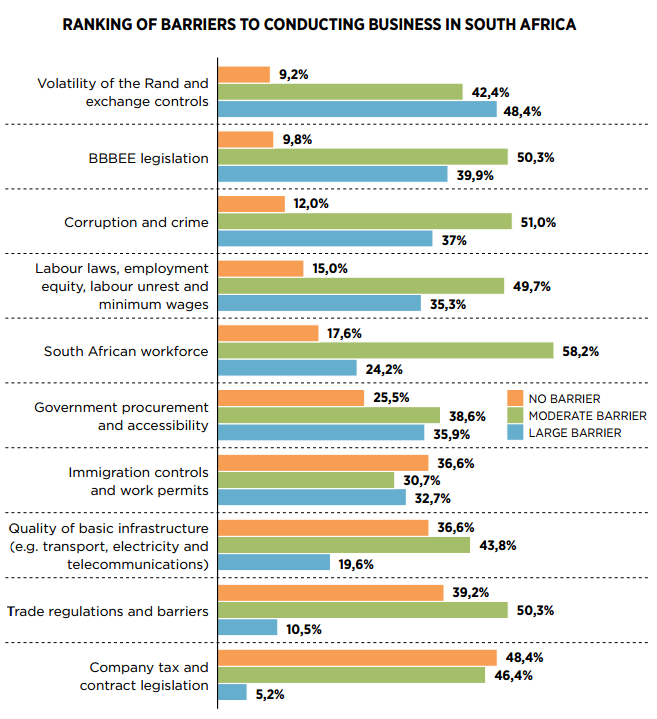 Key barriers identified by respondents included the volatility of the Rand, BBBEE legislation, crime and corruption and labour related concerns. However, the majority of respondents said that they would recommend South Africa as a business location. Although South Africa is perceived as having a deteriorating business climate; it is still a desirable investment destination compared to emerging market peers. Stefan Sakoschek, Executive Chairman of the EU Chamber of Commerce and Industry of Southern Africa, noted that there is a need for continued dialogue on interventions to improve the business environment and improve competitiveness. Imani Development has been managing the EU-SA Business Links project for the past two years.